GROSSETO, Italy (AP) -- The Italian court trying the captain of the Costa Concordia heard grim details Wednesday about how the 32 victims of the shipwreck drowned, some after diving or falling into the sea from the capsized cruise liner when lifeboats were no longer accessible. A court official read out the names of the deceased passengers and crew members, and described how each one died, quoting verbatim from the indictment of the Concordia's captain, Francesco Schettino. The veteran Italian mariner is the sole defendant in the trial, which is being held in a theater in the Tuscan town of Grosseto. Schettino is charged with manslaughter, causing the January 2012 shipwreck off the Tuscan island of Giglio, and abandoning ship with "hundreds of passengers and crew still aboard, unable to care for themselves or in need of coordination as the ship's tilt increased," the official said. The Concordia, on a week-long Mediterranean cruise, speared a jagged granite reef when, prosecutors allege, Schettino steered the ship too close to Giglio's rocky shores as a favor to a crewman whose relatives live on the island. The reef sliced a 70-meter-long (230-foot) gash in the hull. Seawater rushed in, causing the ship to rapidly lean to one side until it capsized, then drifted to a rocky stretch of seabed just outside the island's tiny port. Survivors have described an evacuation that was so confused and delayed that by the time it got under way lifeboats on one side of the Concordia could no longer be launched because the vessel was already badly listing. The reading of the list of the victims began with the death of a Frenchman, Francis Servel, who "not having found a place on the lifeboat, threw himself into the sea without a life vest." He was "sucked toward the bottom of the whirlpool produced by the final flipping over on the right side of the ship, and then died due to asphyxiation." Shortly after the tragedy, survivors recounted how Servel had given his wife his life vest because she didn't know how to swim. The bodies of victims No. 31 and 32 were never found, but after a long, futile search of the ship's interior and the nearby waters, they were declared dead. One of them was a middle-aged Italian passenger, Maria Grazia Trecarichi, who, with no place on a lifeboat, and "while waiting to be rescued" while wearing a life vest, "slid off into the sea because of the progressive tilt of the boat" and presumably drowned, the court official said, reading from the indictment. Victim No. 32 was a Filipino waiter, Russel Terence Rebello. The court heard how the crewman "remained on the ship to carry out the lowering of the last lifeboats" and either fell or dove into the sea because of the Concordia's dramatic tilt and was presumed to have drowned. Other victims drowned aboard, as violently swirling water rose up inside the ship. The court heard how some passengers were "sucked into a vortex" of water rushing into the ship when the Concordia capsized. This happened after the crew told them to go to the other side of the ship where lifeboats were being launched, and the passengers ended up trying to walk down a tilting corridor. Wednesday was the first full one-day hearing in the trial, which is expected to last into next year. Last week it was postponed by a lawyers' strike. Earlier Wednesday, lawyers for Schettino said they were making a last-ditch attempt to reach a plea bargain in the case, which could result in a long prison sentence if the captain is convicted. One of his lawyers, Donato Laino, told reporters the defense wanted a deal that would see Schettino plead guilty in exchange for a three-year, five-month sentence. Schettino risks up to 20 years, if found guilty of manslaughter and the other charges. The bid is essentially a "formality since the prosecution will tell us 'no,'" the LaPresse news agency quoted Laino as saying. It was not immediately clear when a ruling regarding the plea bargain might come. But prosecutor Francesco Verusio told reporters during a recess that he has opposed it because of the "seriousness of the conduct of the accused." In May, a different judge in pretrial hearings rejected Schettino's first bid for a plea bargain after the prosecution said no. But deals have been approved for the five other defendants, including the helmsman and other ship officers who were on the bridge of the ship with Schettino when it rammed the reef. The five included an official of the Italian cruise company Costa Crociere SpA who was managing the crisis on land. A judge is expected to rule on Saturday on those defendants' requests for lenient sentences, no longer than about two years. In Italy, sentences are often suspended in the cases of first time offenders that result in punishments of a just a few years or less. 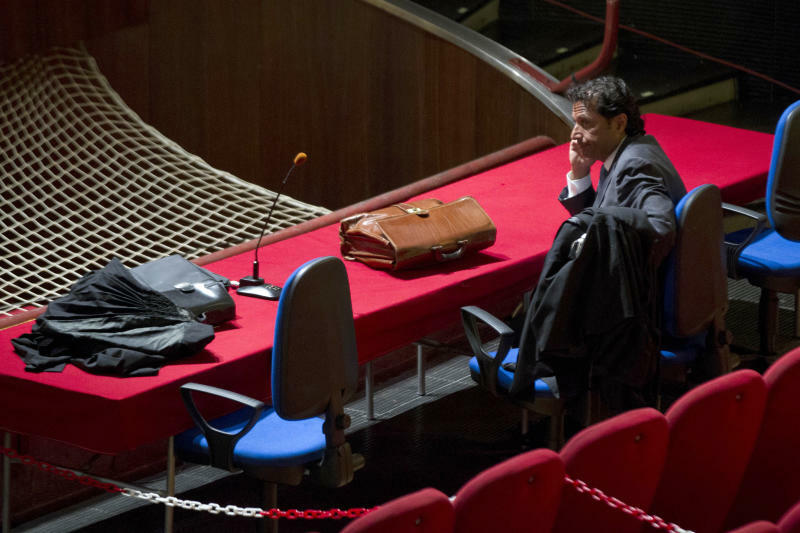 That would leave Schettino, who depicts himself as an innocent scapegoat, as the only defendant risking a long sentence. Prosecutors have alleged he deliberately guided the ship dangerously close to the island's rocky coast. The maneuver "was a favor that the commander, Schettino, wanted to do" for a crew member whose family lives on Giglio "so they could watch an ultra-close passage (of the Concordia) near the coast," Verusio told reporters outside the courtroom. Some of the 4,200 passengers and crew members who were aboard the Concordia said Schettino shouldn't be the only person tried. "Frankly, I'm not angry with Schettino," said Gianluca Gabrielli, a 33-year-old Roman who is a surviving passenger. "I'm angry with the whole crew. They were smiling at the beginning, but when they realized that there was danger, they escaped, abandoning us," Gabrielli said outside the Grosseto theater, which is serving as a makeshift courtroom to allow more space for the public. Many survivors who jumped into the sea and swam to shore have recalled their shock and amazement that Schettino was already there while others were still on the boat. Most of the last survivors had to be lifted to safety from the capsized wreck by helicopters. Many survivors and families of the people killed in the disaster have filed civil actions that could allow them to seek monetary compensation from Schettino, if he is convicted. On Wednesday, Judge Giovanni Puliatti allowed the Italian cruise company Costa Crociere to do the same. In April, a judge in Tuscany fined Costa 1 million euros ($1.3 million) for the shipwreck, the maximum amount allowed under Italian law. At Wednesday's trial, lawyers for Schettino and for survivors told the judge they objected to letting Costa attach a civil action to the criminal trial. But Puliatti sided with the company, indicating there was no such contradiction. Most of the seats in the theater Wednesday were empty, as it was widely expected that the hearing would be taken up by procedural matters, with no testimony scheduled. Those issues include the judge's decision about which of some 150 witnesses will be called to testify and when. Testimony is unlikely to begin before September because courtrooms in Italy generally break for vacation in August. D'Emilio reported from Rome. Francesco Sportelli contributed to this report from Grosseto.